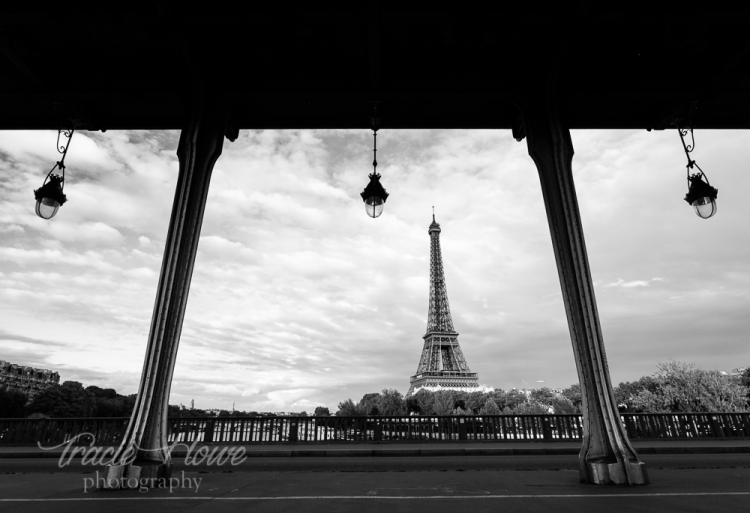 Pont Alexandre III engagement in Paris – Xavier & Randa » Tracie Howe Photography – Seattle Wedding Photographer | Seattle elopement photographer | Destination wedding and elopement photographer | Pacific Northwest wedding and elopement photographer | Family and lifestyle photographer | Travel photographer based in Seattle. Last fall I began a trip to Europe in one of the most romantic cities in the world – Paris! So, what is a solo photographer to do in such a romantic city? 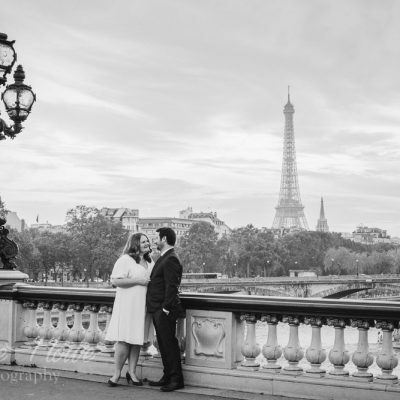 A Paris engagement shoot, of course! 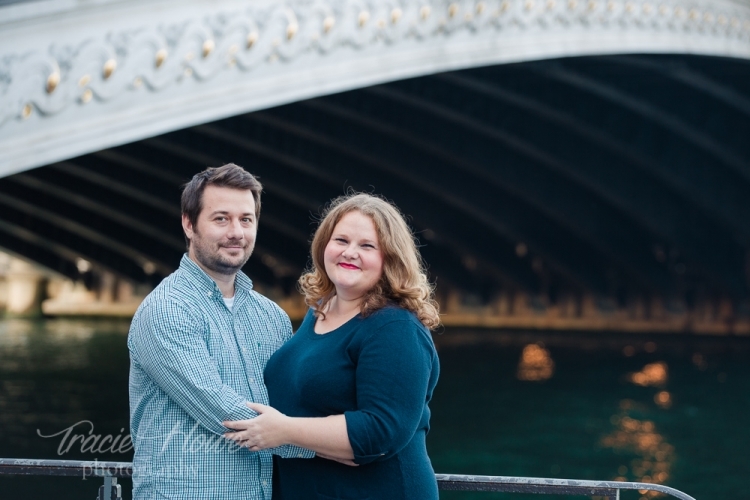 I had the opportunity to work with Xavier and Randa, a laid-back local and a sweet American expat. Their Parisian shoot was actually a two-parter. Part one was the engagement shoot, followed by an unexpected clothing change behind some bushes due to restricted restroom access. Part two was the pre-wedding shoot (wedding attire before the actual wedding), which I will share in a later post. Having explored much of Paris, I knew that there were only a few spots that met our requirements for these photo shoots. The place had to be beautiful, unmistakably Paris, and not overcrowded with tourists! Of course, I also HAD to have some Eiffel Tower shots, because what says “Paris” more than the Eiffel Tower? While there were many Paris sites that met the first two qualifications, most of those were very crowded. We considered Trocadero for that quintessential Eiffel Tower view, but that was best photographed in the early morning to avoid crowds, which didn’t work for us. There was also Pont de Bir-Hakeim (formerly Pont de Passy), but I discovered on the first night that this offered only a few perspectives and was already overrun with photographers at the time when we could schedule the shoot. We agreed on the gorgeous and iconic Pont Alexandre III bridge as the destination for both the engagement photos and pre-wedding shoot. 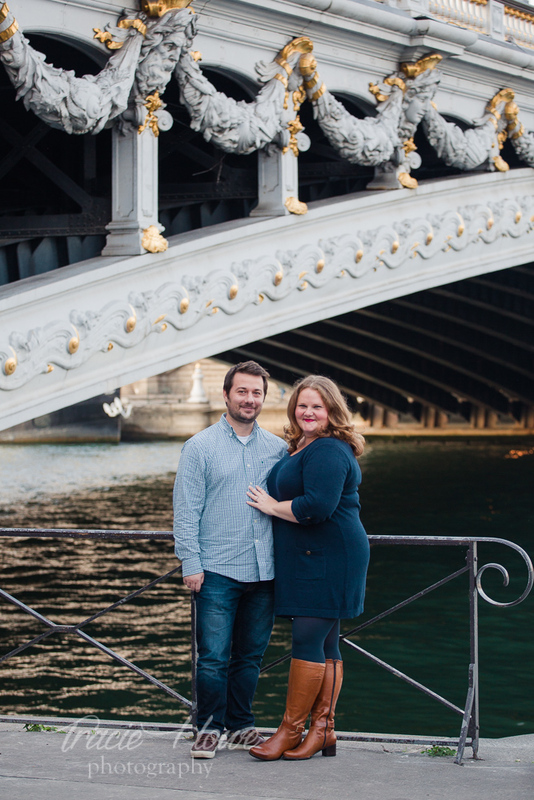 This elaborately designed bridge stretching over the River Seine offers a lot of variety for an engagement shoot – on the bridge, under the bridge, Eiffel Tower views, and even some beautiful fall foliage nearby! 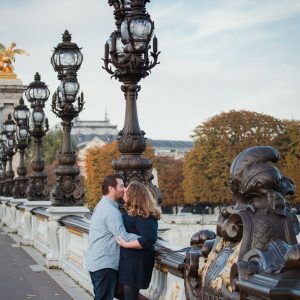 I couldn’t have asked for more from this Pont Alexandre III engagement or from my adorable, multi-national couple! They only recently just had their official wedding, so now I’m allowed to share all of these photos. 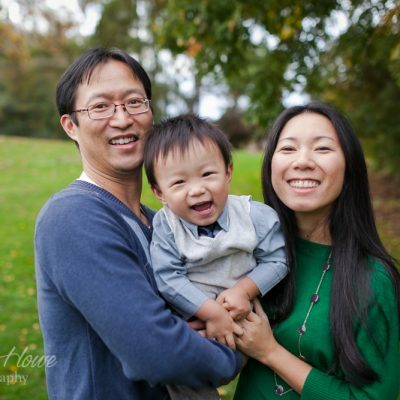 Read more about Randa and Xavier in their own words, at the bottom of this post. Enjoy the photos and check back soon for the pre-wedding photos! How did you first meet? Who, what, when, where, and why? R: Met online – we both had only been on a few dates until we met. 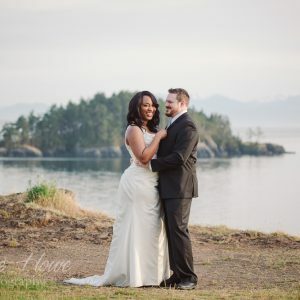 He messaged something insightful and witty, about our mutual love of travel, wine and kayaking… and suggested we might have more in common despite OK cupid matching us at only 28%! If you feel comfortable, please tell a funny story that happened while you were dating. R: After a lovely and ‘typical’ first date, a few days later he sends a message: ‘do you like tattoos? ‘ I was so confused…there wasn’t any other context provided, it was so random! Was it a fetish? An awkward intro to a second date? Was he asking for my advice? Was it a lost in translation issue? Turns out it was the second one: there was a World Tattoo Festival, with concerts, etc. and he was suggesting we check out the music. But without any other context…? I was lost! X: Also at the tattoo festival, we saw people getting tattoos of genitalia, and she said, I wonder what kind of animal that is..? And I had to explain she was looking at it backwards… and it was something else. Awkward. X: When she asked if we were exclusive. It was so cute! For me, it was obvious. R: Ha! We met online, of course I had to ask! For me, it was a weekend away. Relaxing and fun and then I went and suggested a stop at Ikea on the way home. He hates it and will do anything to get out of it, but we went. The crowds, traffic, getting lost… it was a mess. And through it all, he remained and is always calm and patient. Tell the story of the proposal: Did you see it coming? How long was the planning? How did you feel? Were you nervous? Etc. R: We had talked about it, but he still surprised me. We went away for a couple days, to Monet’s gardens in Giverny, the flowers were in bloom and it was stunning weather! I started to wonder… is this it? But nothing happened! It wasn’t until the end of our trip, he was waiting for the perfect moment, to propose under cherry trees (I love flowers and cherry blossoms especially). We arrived in this beautiful park, headed straight to the cherry blossoms and then… they weren’t in bloom, we were a week too early. Poor guy! But we found a sunny bench and that’s where he popped the question! Flowers, cherry blossoms, none of it mattered, we were just so happy! X: I was nervous about finding the right moment and place. I was worried about the flowers not being in bloom, and then that was the case. But it was still a nice environment, so I went with it. 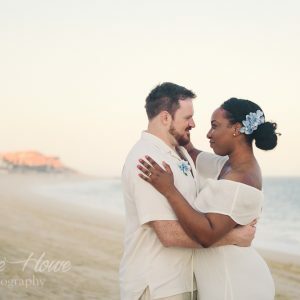 What do you love about your engagement shoot location? R: The architecture and the light! It was the perfect spot to show off Paris. As a tour guide in Paris, I spend a lot of time in the Eiffel Tower and other monuments, so I was really happy that Tracie chose a spot that is a little less cliché Paris, but still perfectly represents the city where Xavier met and fell in love. The Alexandre III bridge and that area were perfect because we could see the Eiffel Tower in the background, but it wasn’t the primary focus. With this location, we also see the details of the bridge, the arches and sculptures. And I love the way she took advantage of the beautiful symmetry of the trees.